Get today's best hotel prices! The under-visited Ston and its neighbour Mali Ston on the Peljesac peninsula are a great escape from the standard southern Dalmatia tourist route. About 59km northwest of Dubrovnik, there are no big resorts or luxury hotels in Ston but there is great eating, great scenery, old stone houses and the longest fortifications in Europe. It's not the place for a beach holiday (for a sandy beach head to the nearby Prapratna cove) but there's plenty to see and the small-town atmosphere is enchanting. The best time to visit Ston is during the annual salt harvest which takes place every July and August. Salt production has been an economic mainstay since the Middle Ages and the saltworks of Ston are among the oldest and best-preserved in Europe. The salt is still harvested by hand and then loaded onto wagons for distribution. On the northern end of the Ston isthmus, Mali Ston was founded in 1335 as part of the Republic of Ragusa (Dubrovnik). It was essentially a defensive town, meant to protect powerful Ragusa, with an impressive arrangement of walls and towers. The most outstanding feature is the fortress of Koruna, rising over the village and visible from quite a distance. The port of Mali Ston was completed in 1490 and clearly resembles the port of Dubrovnik with three arsenals, a round tower and a fortified port gate with a Romanesque statue of St Blaise over it. Only one kilometre southwest of Mali Ston is the slightly larger village of Ston and connecting the two is an amazing wall of more than five kilometres. Circling Ston, the walls climb up to the hilltop Pozvizd Fortress and follow the line of the isthmus to meet up with the walls of Mali Ston. 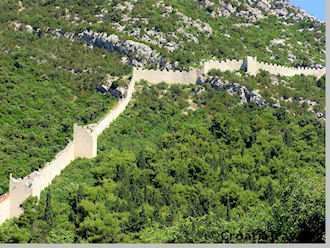 The walls of Ston comprise the longest fortress system in Europe and second only to the Great Wall of China internationally. The walls stretch for 5km and include 40 towers and five fortresses. An extensive 50-year renovation of the walls was completed in 2009. Why so long? Authenticity, that's why. Each new stone was hand-carved just as the originals were back in 1334 when construction began. Ston was walled at about the same time as Mali Ston but had been settled as early as prehistoric times. The Romans named Ston Turris Stagni and it became an essential part of the Ragusa Republic (now Dubrovnik). In addition to admiring the medieval architecture, take a look at the Veliki Kastio (Big Citadel) a large quadrangular fortress on the southeastern corner of town. The Ston Wall Marathon is held annually in September. The event attracts runners from around the world and includes the possibility of participating in marathons of 15 and 4km. More. It's not against the law to leave the "Stons" without sampling the seafood but it's certainly inadvisable! Try the restaurant of the Villa Koruna or Kapetanova Kuca restaurant, part of the Hotel Ostrea or Bella Vista on a cliff overlooking Prapratno Bay. Lying on the main route between Dubrovnik and Korcula the villages are an easy drive from either place. All bus services between Dubrovnik and Korcula stop at Ston and Mali Ston. See the bus schedules from Dubrovnik. 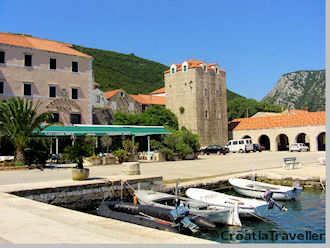 The Ston tourist office (tel 020 754 452) is in the town centre at Peljeski put 1.